Khenpo Lophel is from Kham Riwoche and entered the Riwoche monastery in Tibet in 1986. In 1990 he took the beginning vows of a novice monk. He studied the practice and prayer rituals of the Taklung Kagyu lineage there until 1997. In 1997 Khenpo went to Bier, India to study at the Dzongsar Monastery Shedra. He completed his studies of the thirteen major Buddhist philosophical texts and the eighteen renowned Buddhist scriptures in 2005. In 2002 he received the complete Gelong vows of a monk from His Holiness the Dalai Lama. 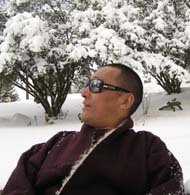 After completing the Dzongsar Monastery Shedra, Khenpo studied the sciences of reasoning and cognitive knowledge at Sera Jey Monastery for 1 year. Khenpo Lophel then went to the Riwoche Monastery in Nepal where he taught for one year as Lopon. H.H. Pakchok Rinpoche then gave him the title of Khenpo. Khenpo Lophel arrived in Toronto in the summer of 2006 where he assists and teachings depending on the needs of the students. In this way he teachings Tibetan language, Tibetan instruments and Dharma in a formal setting.